The pinto bean (Spanish: frijol pinto, literally "painted bean") is named for its mottled skin, hence it is a type of mottled bean. It is the most common bean in the United States and northwestern Mexico, and is most often eaten whole in broth or mashed and refried. Either whole or mashed, it is a common filling for burritos. The young pods may also be used as green beans. In the southwest United States, the pinto bean is an important symbol of regional identity. Along with the chile/chilli, it is one of the official state vegetables of New Mexico (under the name frijol). The prepared beans are commonly known as frijoles. 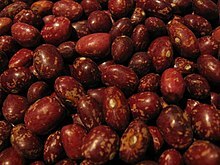 This is the most commonly used bean used for refried beans (fresh or canned) and in many dishes at Tex-Mex restaurants. Rice and pinto beans served with cornbread or corn tortillas are often a staple meal where there is limited money for meat, as the combination of beans and corn provides virtually all the protein amino acids needed in a meat substitute. When it comes to making chili, if a bean is added, this is the one typically used, although the kidney bean, black bean, and many others may also be used in other locales. The alubia pinta alavesa, or the Álava pinto bean, is a red variety of the pinto bean which originated in Añana, a town and municipality located in the province of Álava, in the Basque Country of northern Spain. In October, La Feria de la alubia pinta alavesa, (The Festival of the Alubia pinta alavesa), is celebrated in Pobes.